An Apple A Day Plus Franks’ Hot Sauce! An apple a day keeps the doctor away. OK we heard that one. But what if apples are boring to you? Have no fear. Since I’m from Buffalo New York, I put Franks’ Hot Sauce on everything. Even apples. Try it – I dare you! One apple, eaten whole with the skin, has nearly 17 percent of the recommended daily dietary fiber intake. This is enough to contribute substantially to colon health if eaten daily. Researchers at Cornell University say the phytochemical quercetin (a strong anti-inflammatory) in apples has stronger anticancer properties than vitamin C.
Apples help to detoxify metals in the body, protect against heart disease, clean the bladder, lower blood cholesterol and blood pressure, and stabilize blood sugar. I like Fujis and Honeycrisps. And if you like it HOT, the Capsaicin, the substance in cayenne, stimulates the endorphins (the body’s natural painkillers). In one British study, eating 3/5 teaspoon hot pepper sauce one time was found to raise the subjects’ metabolic rate by 25 percent, causing them to burn an extra 45 calories in three hours. 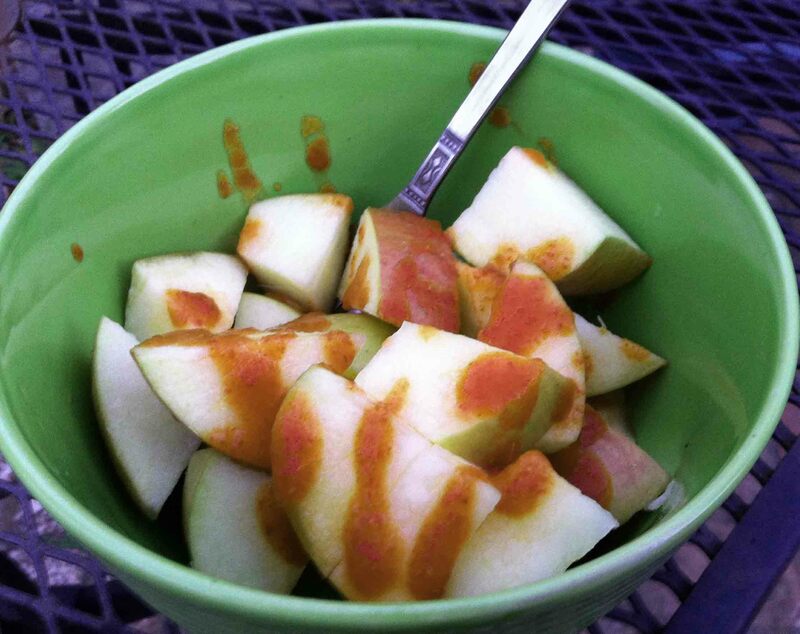 Tapatio, while a very serviceable hot sauce, overly sweetens the apple; the sauce flavor also overbalances the apple flavor. Gonna try Crystal hot sauce next. And Saracha – which i recommend on pineapple or cantaloupe.